Codecs required to play movies selected by you. Improved movie playback. Direct Show support added. 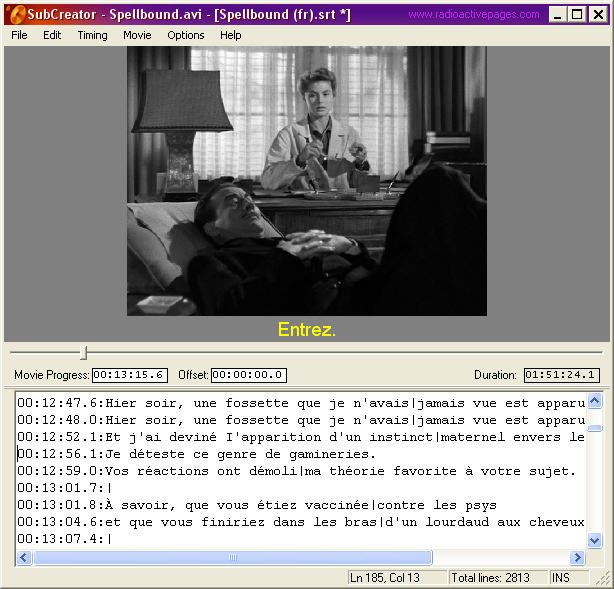 Added MPL2 subtitle format support. Replaced Select All keyboard shortcut to a standard Ctrl+A. Better control over the very short durations of lines. Help system converted to a HTML (runs on Windows 7). Fixed saving unsaved data when closing SubCreator. Simplified storing default location of movies and scripts. Time edit control allows pasting time (accepts different time formats). Corrected line swapping action issues. Replace dialog wasn't accepting replacement into an empty string. Fixed. Improved visual appearance of the main application window. Zipped package contains an MSI installer file. Run it to start installing SubCreator. Go to the Details page to read more on SubCreator. If you found a bug in the SubCreator you may report it here. Copyright Radek Strugalski 1999-2015. Any duplication of content without prior author consent is strictly prohibited.